The idea to re-model our house entrance was not on my schedule of renovations. It was not until I was working on the front door in June of 2013 as part of my doors project, that I started thinking about changing some things around the front door. The house entrance project just took on its own momentum. One thing turned into another and so forth. If I was painting the door, I needed to paint the door frame. If I do that, then I need to update the moulding. While I am doing that, I might as well update the window, which leads to fixing the ceiling above everything, and so on, and so on. Our front entrance is very small. The actual square footage of the area is 5 1/2' x 6 1/2'. The area even feels smaller because the ceiling is only 82" high. 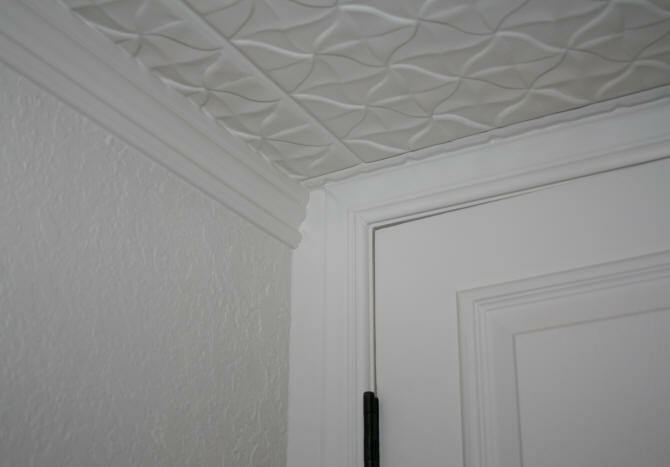 The ceiling could also be called soffit. It hides the duct that goes into the kitchen. The top of the door just misses hitting the ceiling. 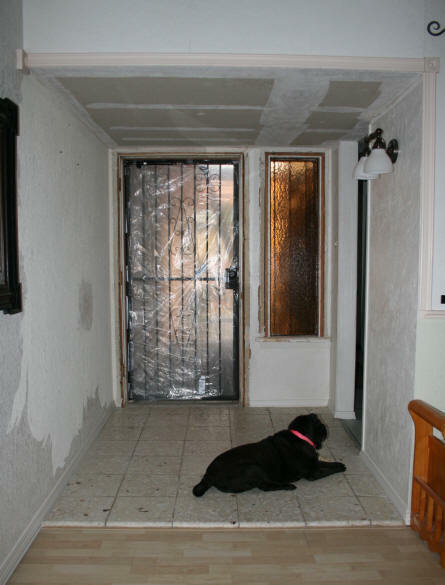 The photograph below shows the entrance area before I did the most current renovation. 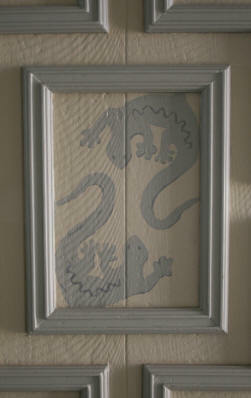 When we purchased the house, the wall with the door and wall with the light, had peeling wallpaper on it. I had removed the wallpaper, used textured, and painted the walls. The light fixture was updated a year ago and matches the wall light fixtures throughout the home. The opening on the right leads to the kitchen. What I have always hated, were the tiles on the floor. They are at least 1" thick marble tiles. To remove them I will need something like a jack hammer. So they will stay put for now. The door of course, was an eye sore. Then there is the window. The "lovely" gold plexiglass that you cannot see out of. To see who was at our front gate, which is kept locked at all times, you have to open the front door. I wanted to be able to see who is at the gate before I open the front door. There is also a large chunk of the window sill that had been chewed on by our dogs that needed to be repaired. 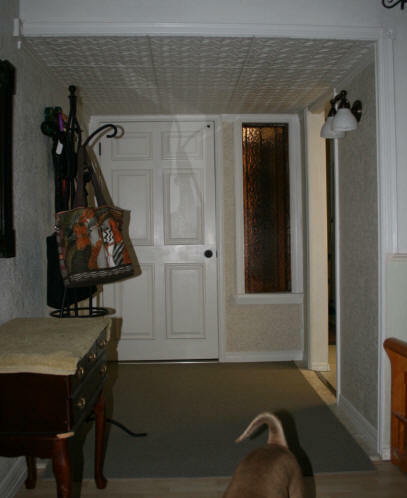 The moulding to the left of the front door and to the right of the window ends one inch before it hits the wall. What bothered me about this, was the fact that dust loved to collect in these one inch spaces. It was also hard to clean. 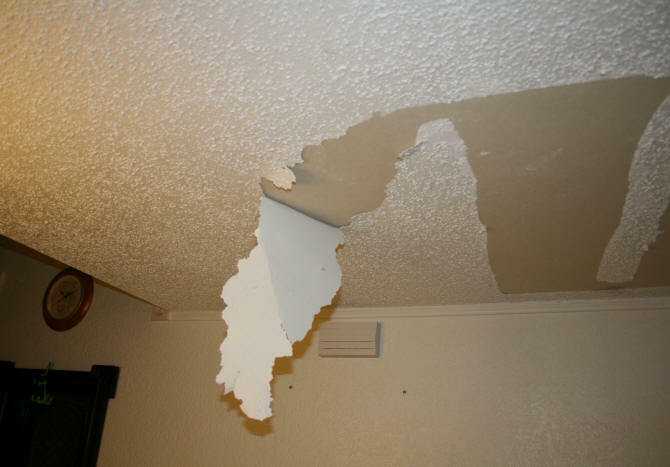 I also hated the popcorn ceiling. Something I have been removing from a room when I start renovating it. The popcorn has so far been removed from the laundry room, bathrooms, and main hallway. The other hassle with the popcorn on this low ceiling is that it gets hit a lot if you are carrying something through the area. It is easy to forget that the ceiling is lower, and whack, you hit the popcorn and there is white stuff all over the floor. The first thing I started working on was the front door. This took a few weeks of stripping and sanding. 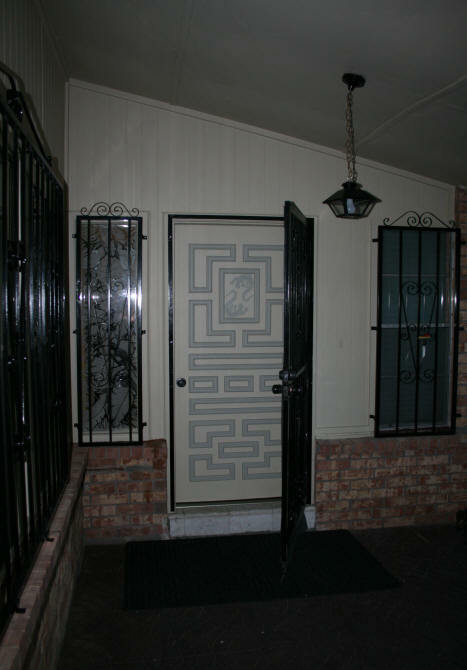 The photos for the completed front door are below. Yes, that is the same front door finished with faux panels on the inside. I explain how I did this on the doors page. 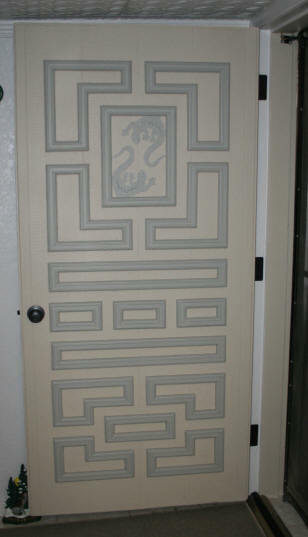 The outside of the door already had the decorative moulding on it and was originally painted a solid orange color. I painted the outside of the door with the new outside paint color with a darker shade used for the moulding and the gecko motif that I added. While I was working on the front door, I started working on the demolition of the area. I needed to remove the existing moulding along the walls. Repair the window sill. Look for a replacement for the gold plexiglass. Shop for new moulding. 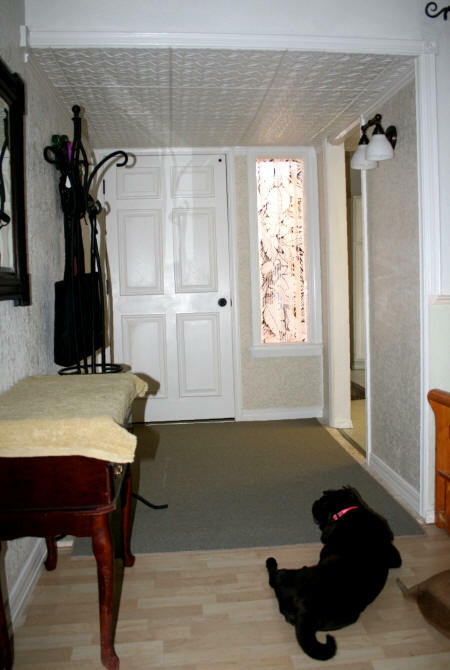 Purchase and cut to size a new threshold for the door. Remove the popcorn ceiling. 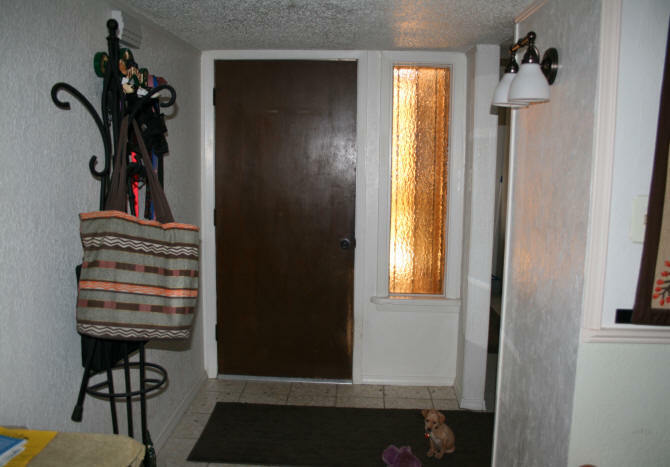 Find one rug that covered the ugly tile floor. The first thing I tackled was the replacement for the gold plexiglass. I knew this would have to be something I had to special order to fit this spot. The size of the existing plexiglass was 15" x 56 1/2". Glass in the window is not a good option when you think from a burglar's point of view. Break the glass, slip the hand through to unlock the door. I did not want to use plexiglass again. So I looked on the internet for other inexpensive materials that were out there, as a replacement for glass or plexiglass. I finally came across polycarbonate sheets as a tough clear alternative to glass or plexiglass. 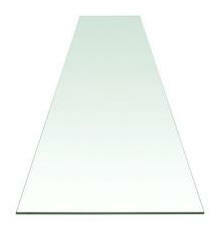 I found a few websites where they sell a vast selection of polycarbonate sheets in a variety of thicknesses. Some companies will even cut them to the exact size you need. It was the price that kept me from ordering from them. By the time that shipping was added on to the cost of the polycarbonate sheet, it was costing me more than $200 for this one window. The shipping for one company was more than the item itself. Forget that! So I looked for another option and I finally found it on the Home Depot website. Clear polycarbonate sheets that are sold as shelf liners for wire shelving. The size they had that I needed was, 16" x 72" with a thickness of .006". The liners came as a four pack. I would not need all 4 sheets, but at $76.18 this was a deal, compared to the other websites that specialized in polycarbonate sheets I figured I would place two sheets on top of each other in the window. For a total thickness of .012, which would be about the same thickness as the plexiglass I was replacing. I went ahead and ordered online. This item was something that the El Paso stores did not keep in stock. This order took almost a month. Sigh... The first order that came was the wrong size. They sent me the 14" width. It would have worked for a shelf, but not for my window. Besides, I paid for the 16" gosh darn it! The fastest return option was to return it in person for a refund. Then they told me I needed to place a whole new order, which I did. I finished everything around the window in the meantime. When I started to remove the popcorn texture from the ceiling, my plan was to scrape it off. What has happened in the past when I have done this, is that I am left with a texture that is similar to what is on the walls. When painted, you cannot even tell it had a popcorn texture before. What actually happened instead, was that the whole paint came off in big sheets. Thanks in part to the extra humidity that the house had in it. This humidity came from the swamp cooler (evaporative cooler) that had been running non-stop most of the summer. So much for having a textured surface! I now had a ceiling stripped down to the drywall surface. The photograph at the right shows the entrance area after the ceiling popcorn was removed. 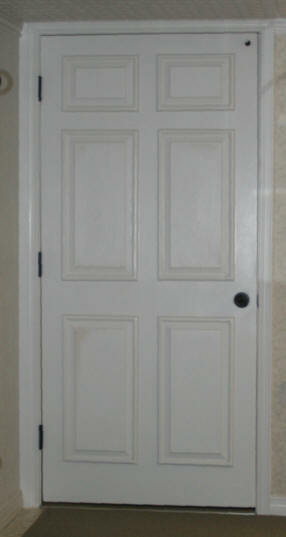 The moulding around the door and window had also been removed. Plastic was on the screen door to keep the heat out. It was in the upper 90's and 100's while I was working on this. The door was still being worked on outside. I had also started to peel the paint off of the left wall. So many coats of paint had been added to the walls by the previous owners, it came off that easily. I ended up peeling this whole wall down to the drywall and repainted it. There was also a raised area on the wall where the door knob had gone through the wall. I needed to level this lousy patch job. I still needed to remove the floor moulding and moulding around the kitchen entrance. For the ceiling I thought about spraying texture on the ceiling. 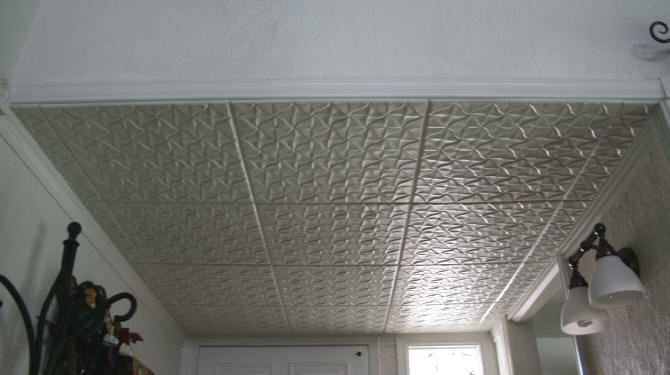 I then remembered seeing ceiling tiles before in catalogs and online and decided to research this option instead. 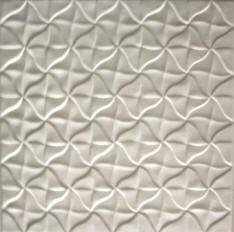 I came across the website Ceiling Tiles By Us that offered styrofoam and PVC ceiling tiles. Styrofoam you ask? Like egg cartons? Yes, just like the styrofoam used in egg cartons. They had a lot of different styles. But I wanted a small scale simple design because the area I had to cover was small. I also worried about the installation, but I found an installation video on the Ceiling Tiles By Us website that showed exactly how to do it. They used Acrylpro mastic in the video, but this product is not available at the Lowe's in El Paso. I picked up a quart of Type1Mastic for ceramic tiles, which is basically the same thing. Cutting the tiles was very easy. Just use a new blade in your cutter. The only problem with the tiles was the size. The website says they are 20" square. The tiles that I ordered were actually 19 3/8" square. This was a slight problem for me because I ordered exactly what I needed, 16 tiles. I did have some extra strips after cutting the pieces that went along the wall. I used these to fill in the 1 1/2" space I had on the ceiling by the door. If the website had given the actual size of the tile, I would have ordered 4 more. I do not know why they rounded up to the nearest inch. It would be better to just give the actual size, even if it is an odd one. Other than this size issue. The tiles did go up easily and have stayed put. They are styrofoam, so they will dent or scrap easily. For my entrance ceiling I need to be extra careful. For a ceiling at the normal height of 8' or more, there should be no problem with this. When the tiles are painted, you cannot really tell that they are styrofoam. My husband had to touch them to be convinced. Some tips when installing the tile. If you are going to paint them, do it before you install them. I originally was not going to paint them but then I decided to, after I installed them. Use caulk to seal the seams. It gives the tiles a more finished look. If you painted the tiles before hand, then you only have to paint the seems after you caulk them. For a $66 investment, the ceiling tiles came out nice. I was pleased at the end result. The other thing I had to tackle was the moulding around the door and the window. I did not like the one inch on the sides where the moulding stopped. The best way I came up with to fix this was to find a wider moulding that matched my existing moulding around the door, which I did find. The photos below show how this worked. Now I don't have to squeeze a rag into the corner to clean out the dust. No bumpy surface for the dust to collect on. 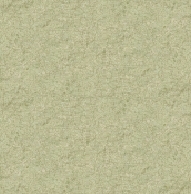 I had also decided to add some of the left over fossil green textured wallpaper I had used in the main bathroom on the front and right wall covering up the terrible texture job I had done 10 years ago. 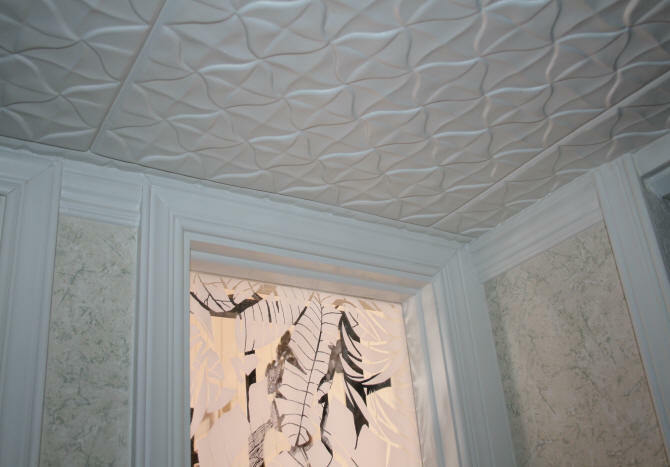 This textured wallpaper went over the uneven surfaces easily. The photograph on the right shows the entire entrance area completed, except for the window. I was still waiting on the polycarbonate sheets. The only moulding left to install was the moulding around the window that would be used to hold the polycarbonate sheet in place. A wider moulding had also been added to the wall along the ceiling and floor. The same moulding that I had just added during the renovations of the man cave, main bath, and master bath. I could not find an area rug at a reasonable price that fit this space exactly. It had to be inexpensive because of the dogs. I did find a cheap 5' x 7' rug at Lowe's for $19.99. These rugs appear to be remnants left over from some large commercial job. They finish the edges and wa-la, area rug. It hangs over a little at the transition between the tile and laminate flooring. We are so used to this hump after 15 years, that we do not trip on it. So far the rug is holding up good. By the end of July 2013, my polycarbonate sheets finally arrived. I then had to deal with how to cut them. The material is tough! I would first try cutting them with a sharp blade and then snapping off the excess. If I was not able to do that, I would try my table saw. I was able to cut them with a blade. I first clamped my stainless steel cutting edge on both ends to keep it stationary and then made the cuts. With my weak hands it took several passes but I was able to do it. There is a protective film on both sides of the sheets. Keep it on until you are done cutting. Since I was going to put two sheets on top of each other I especially did not want to get any finger prints or dust on the inside of the two sheets, where they might be visible for decades. The window came out looking great. The polycarbonate is very clear and looks like glass until you touch it. The two left over scraps I had were large enough to fit on two small skylights in the house. I replaced the acrylic sheets that were covering the skylights with the polycarbonate adding the window film that I used on the window. About the window film. Now that I had a window that I could see through, people at night could see into the house if a light was on. I needed to balance this a little. I have used window film before. So I thought this would be the perfect solution. Some of the film allows you to see out, which is what I wanted. When I went on the internet, I was pleasantly surprised to see that the window film market has greatly improved over the last 5 years with many more designs and sizes than were previously available. I came across an etched glass design that has clear areas. This would allow me to see who was at the front gate without them seeing me during the daytime. During the day all you see is a reflection on the outside anyways. You cannot see in. At night with a light on in the house, you have a distorted view. Plus, the etched glass style let a lot more light in than the stained glass window tints. 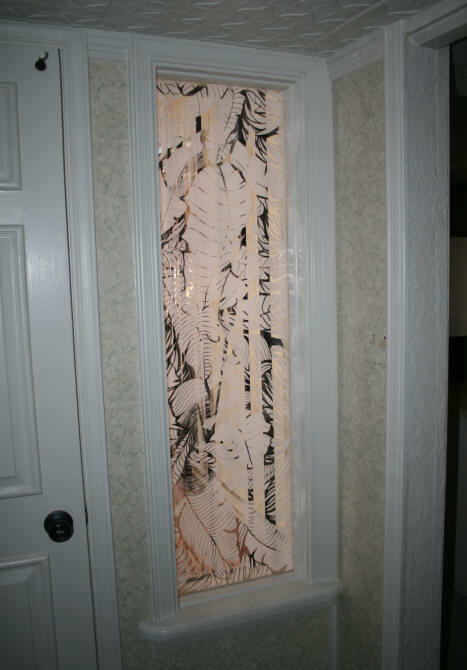 I ordered the Etched Glass Tropical Leaves film from WindowFilmWorld.com. They had a sidelight width close to my dimensions. The left over film was used on my skylights. The other thing about this window film? It is removable. So if I decide to remove it or change styles, I can do so without damaging the polycarbonate window. The finished front entrance is pictured at right. With Satin our black Shar-Pei sitting guard. I am still looking for a replacement for the ugly console table in the picture. One-of-kind, custom made cork and chalk board combination The only thing left to make was my bulletin board. The old brown door had a piece of cork attached that was used to stick things that were reminders for appointments, coupons to use, etc. It came in handy. I had already bought a package of 4 - 12" cork tiles at Lowe's. I did not know how I wanted to use them when I bought them. 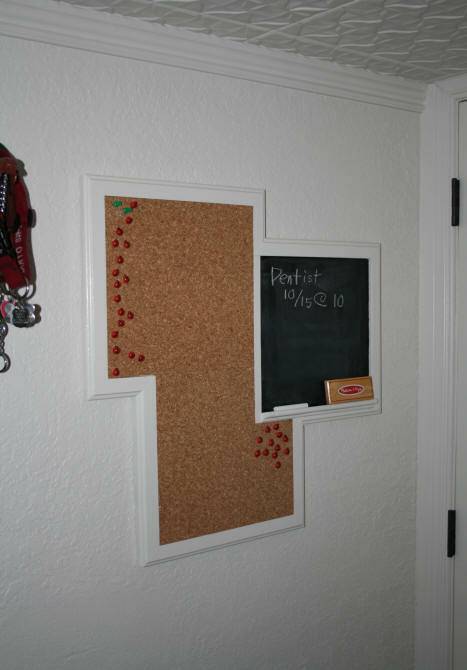 I thought of making a small cork board that fit on the door. But now that I had a door that looked beautiful, I did not want to put anything on it. 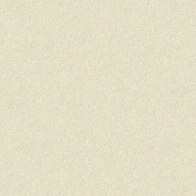 I had also seen the new blackboard paint that is readily available at stores now. I came up with the idea to create a bulletin board that was both a cork and chalk board. In my computer graphics program I designed a custom bulletin board. I then cut the bulletin board to the measurements I had from some scrap plywood. I recycled the old moulding I took off of the kitchen opening and used it for the frame. The chalk board section was painted with the black board paint I bought. I added a little ledge to hold the eraser and chalk from scrap moulding. The rest of the board was painted white. The cork was glued on and is actually two cork tiles thick, which makes it level with the moulding. Because it is not square, I used two hanging hooks to secure it firmly against the wall. The other part of this project that morphed into more work, was the painting of the outside of the front entrance. Newly painted front entrance The front entrance was an orange terra cotta color that matched the bricks. I am changing the color of the outside to match the vinyl which is on the new windows to the left. The window on the right has not been replaced yet. Since the house is a two story, I will need to rent a scaffold or boom to get to the roof soffits and other high spots not safely reached by a ladder. Some of the wood on the exterior is in pretty bad shape. When I start working on that, I will add those projects to this website. Hmmm... in looking at this picture, I think I may add some moulding along the bottom of the bricks. The flooring used on the front cement patio is rubber tiles. I have fallen so many times out here, these rubber tiles now help cushion my knees and hips when I trip. OMG! The sink was leaking the whole time we were away? Why is My Swamp (Evaporative) Cooler Blowing Hot Air?